The MacBook Air line wasn’t the only Mac hardware to get a Thunderbolt-inspired makeover Wednesday. Apple also added a Thunderbolt port to its Mac mini desktop, which sports new processors and discrete graphics as well. The new mini retains the 7.7-by-7.7-by-1.4-inch shape of its predecessor, though there is one key difference to its exterior—there’s no optical drive, giving the new mini the same look as the server configuration. That’s the clearest sign yet that Apple, with its Mac App Store for software downloads and its iTunes Store for music and video content, believes that the future belongs to digital downloads. That would also explain the addition of Thunderbolt, an interface technology that promises high-speed input and output. As on the updated MacBook Air models released Wednesday, the Thunderbolt port on the new Mac mini replaces the Mini DisplayPort, though it remains compatible with Mini DisplayPort for video out purposes. The previous Mac mini generation featured a single configuration: a $699 model with a 2.4GHz Core 2 Duo processor, 2GB of DDR3 SDRAM, a 320GB SATA hard drive, and nVidia GeForce 320M integrated graphics. Apple has replaced that version with two new models, both of which feature more powerful Intel Core i5 processors. In addition to returning to two configurations, the mini lineup is also returning to its old pricing structure, with a lower entry price. The entry-level mini features a 2.3GHz dual-core Core i5 chip. It also ships with 2GB of memory and a 500GB hard drive, though you can opt to boost memory and storage capacity to 8GB and 750GB, respectively. This $599 model also features Intel HD Graphics 3000 processor with at least 288MB of DDR3 SDRAM that it shares with the system memory. The other Mac mini configuration offers discrete graphics with an AMD Radeon HD 6630M processor with 256MB of GDDR5 memory. It’s also powered by a 2.5GHz core-duo Core i5 chip and ships with 4GB of RAM and a 500GB hard drive. (Again, you can upgrade memory and storage capacity if you wish.) That model costs $799. 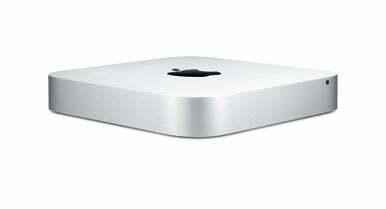 Apple also offers a version of the Mac mini with Lion Server installed. The 2.0 GHz quad-core Intel Core i7-powered Mac mini with Lion Server also offers 4GB of memory and dual 500GB hard drives. It has a $999 price tag.